"I often enjoy the game of challenging listeners (and musicians), while keeping them engaged with something to latch onto, like quirky grooves, creative timbres, or engaging harmonies. As a musical polyglot, there is no single-genre description of my music, since at any given time, it reflects my life's divergent or confluent journeys of that moment." 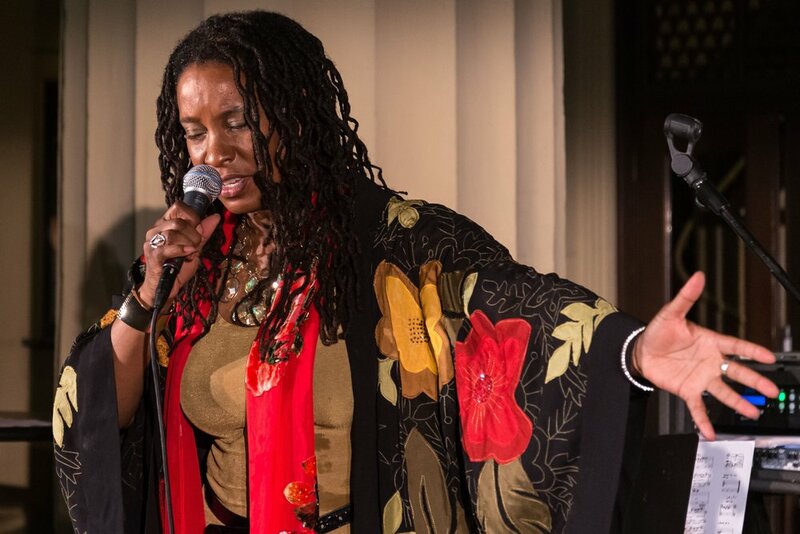 Dawn Norfleet is a Los Angeles-based vocalist, flutist and composer, whose eclectic influences include traditional and contemporary jazz, Stevie Wonder, and Claudio Monteverdi. In 2016, her first orchestra work was selected for the Jazz Composers Orchestra Institute's New Music Readings series by the American Composers Orchestra, in New York City. Two years earlier, she participated in the prestigious Banff International Workshop in Jazz and Creative Music. Her academic and musical journey began in the Los Angeles area, where her musical talents were nurtured by a musical family and local public school music programs. At Wellesley College, she became intrigued by early Italian Baroque vocal polyphony, chromatic music, and the social power of music. Her junior year was spent at Wesleyan University, where she first began taking her musical mission seriously. During that year, she studied jazz theory with Bill Baron and was introduced to the fascinating rhythms of world music, studying South Indian solkattu (vocalized rhythms) with percussion master, Ranganathan. After returning to Wellesley where she graduated with honors, she attended Columbia University's Graduate School of Arts and Sciences, earning an M.A. and Ph.D. in Music (composition and ethnomusicology, respectively). While researching underground hip-hop culture in New York City for her doctoral dissertation, Dr. Norfleet also discovered the Big Apple's vibrant jazz scene. There, she began her musical career among some of the most respected jazz musicians of her generation, including renowned pianists Vijay Iyer and Andy Milne. Eventually, Dr. Dawn returned to her Southern California hometown to immerse herself in the Los Angeles music and arts educational communities as a bandleader in her own right, and recording and performing with saxophonist Kamasi Washington. In addition to performing at Jazz at Los Angeles County of Arts, and Skirball Cultural Center and other venues as a bandleader, she also presented duo concerts accompanied by Andy Milne at Colorado College, Lewis and Clark College, Wellesley College, and University of Virginia. She taught courses in African American music at Colorado College, CSU Pomona, and UC San Diego, lectured at Occidental College, and was a Scholar in Residence at Grinnell College. Dr. Dawn also contributed to the scholarly music publication, African American Music: an Introduction (Routledge, 2015 and 2006) and Black Enterprise Magazine (December 1999). The versatile musician and educator considers it a privilege to share her passion for music as a teaching artist and mentor to young musicians in the Los Angeles area.